For other uses, see Dancing in the Street (disambiguation). Not to be confused with Street dance. "There He Is (At My Door)"
June 19, 1964, Hitsville U.S.A. (Studio A), Detroit, Michigan, U.S.
(1964) "Dancing in the Street"
"Dancing in the Street" is a song written by Marvin Gaye, William "Mickey" Stevenson and Ivy Jo Hunter. It first became popular in 1964 when recorded by Martha and the Vandellas whose version reached No. 2 on the Billboard Hot 100 chart and peaked at No. 4 in the UK Singles Chart. It is one of Motown's signature songs and is the group's premier signature song. A 1966 cover by the Mamas & the Papas was a minor hit on the Hot 100 reaching No. 73. 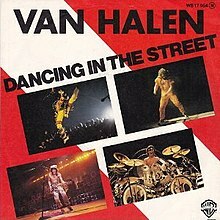 In 1982, the rock group Van Halen took their cover of "Dancing in the Street" to No. 38 on the Hot 100 chart and No. 15 in Canada on the RPM chart. A 1985 duet cover by David Bowie and Mick Jagger charted at No. 1 in the UK and reached No. 7 in the US. The song was also covered by The Kinks, The Everly Brothers, Grateful Dead and Black Oak Arkansas. The original version of "Dancing in the Street" by Martha and the Vandellas was produced in 1964 by William "Mickey" Stevenson and released as a single on the Gordy Records label. The song was written by Stevenson, Ivy Jo Hunter, and Marvin Gaye. The song highlighted the concept of having a good time in whatever city the listener lived. The idea for dancing came to Stevenson from watching people on the streets of Detroit cool off in the summer in water from opened fire hydrants. They appeared to be dancing in the water. The song was conceived by Stevenson who was showing a rough draft of the lyrics to Gaye disguised as a ballad. When Gaye read the original lyrics, however, he said the song sounded more danceable. With Gaye and Stevenson collaborating, the duo composed the single with Kim Weston in mind to record the song. Weston passed on the song and when Martha Reeves came to Motown's Hitsville USA studios, the duo presented the song to Reeves. Reeves recounted that she initially regarded the song as too repetitive. Gaye and Stevenson agreed and including new Motown songwriter Ivy Jo Hunter adding in musical composition, the song was recorded in two takes. The song's writers made sure to include Detroit as one of the cities mentioned with the lyric: "Can't forget the Motor City". The song took on a different meaning when riots in inner-city America led to many young black demonstrators citing the song as a civil rights anthem to social change which also led to some radio stations taking the song off its play list because certain black advocates such as H. Rap Brown began playing the song while organising demonstrations. "Dancing in the Street" had two meanings. The first is the one Martha Reeves asserted to reporters in England. "The British press aggravated Reeves when someone put a microphone in her face and asked her if she was a militant leader. The British journalist wanted to know if Reeves agreed, as many people had claimed, that "Dancing in the Street" was a call to riot. To Reeves, the query was patently absurd. 'My Lord, it was a party song,' she remarked in retrospect" (Smith 221). While Berry Gordy had created the Black Forum label to preserve black thought and creative writing, he kept the Motown record label and the popular hits it produced from being too political. "Berry Gordy Jr. was extremely wary about affiliating his business with any organization of movement that might negatively influence his company's commercial success" (Smith 230). "Motown records had a distinct role to play in the city's black community, and that community—as diverse as it was—articulated and promoted its own social, cultural, and political agendas. These local agendas, which reflected the unique concerns of African Americans living in the urban north, both responded to and reconfigured the national civil rights campaign" (Smith 227). The movement lent the song its secondary meaning and the song with its second meaning fanned the flames of unrest. This song (and others like it) and its associated political meanings did not exist in a vacuum. It was a partner with its social environment and they both played upon each other creating meaning that could not have been brought on by one or the other alone. The song therefore became a call to reject peace for the chance that unified unrest could bring about the freedom that suppressed minorities all across the United States so craved. "Dancing in the Street" peaked at No. 2 on the US Billboard Hot 100 chart when it was originally released as the group's third album Dance Party's first single in 1964 (see 1964 in music), with "There He Is (at My Door)" included as a B-side. It was kept from the top spot by, Do Wah Diddy Diddy by Manfred Mann. "Dancing in the Street" also reached the Top 5 on the UK Singles Chart peaking at No. 4 in a 1969 release after initially peaking at No. 28 on the chart and helped to revive the Vandellas' success in the UK. 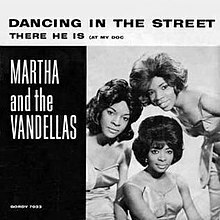 On April 12, 2006, it was announced that Martha and the Vandellas' version of "Dancing in the Street" would be one of 50 sound recordings preserved by the Library of Congress to the National Recording Registry. Lead singer Martha Reeves said she was thrilled about the song's perseverance, saying "It's a song that just makes you want to get up and dance". In 2013, the original Motown recording was remixed for club and summer celebration airplay by Minneapolis' Billboard charting producer/remixer Joel Dickinson as well as Danny Shaffer. Billboard named the song #29 on their list of 100 Greatest Girl Group Songs of All Time. In 1966, the folk rock group, the Mamas & the Papas, recorded a cover version of the song "Dancing in the Street," which was taken from their second studio album The Mamas and the Papas. Mama Cass Elliot sang the lead vocal, while the other members did their harmonies in the background. This version featured an instrumental section. The song's ending is humorous, which featured Elliot and Papa Denny Doherty having a dialogue listing the cities in both the United States, as well as Halifax, Nova Scotia, Canada, where Doherty was from, before the song's fade. At the Monterey Pop Festival in 1967, the Mamas and the Papas ended their set with "Dancing in the Street" before Elliot told the audience at the festival: "You're on your own." This was the last time that the group performed live in concert. "Dancing in the Street" was produced by Lou Adler and issued as the B-side of the single Words of Love (The Mamas & the Papas song) on the Dunhill Records label. It reached No. 73 on the Billboard Hot 100 chart. The rock band Grateful Dead began performing "Dancing in the Street" live in 1966, and through 1971 played the song about 40 times, with Ron "Pigpen" McKernan singing lead. The song returned to their rotation in 1976 with Bob Weir taking the lead vocal, and was played about 80 more times before being retired in 1987. Live recordings from both periods have been released. In that second period, the group recorded a cover version of the song in the studio, and released it as a single taken from their 1977 album Terrapin Station, with the title track on the B-side. This version is credited to Stevenson, Gaye, and Hunter, but is titled "Dancin' In the Streets" rather than "Dancing In the Street". Bassist Phil Lesh has described "Dancing in the Street" as the first song the band stretched out in the live setting from a short pop song into drawn out improvisational jam piece, a practice that would become a Grateful Dead signature. from the album "Street Party"
The American southern rock band Black Oak Arkansas recorded a cover version of "Dancing in the Street", and released it as a single in 1974, taken from their 1974 studio album Street Party. "Where Have All the Good Times Gone" and "The Full Bug"
(1982) "Dancing in the Street"
The American rock band Van Halen recorded a cover version of "Dancing in the Street" in 1982. This version features heavy use of the electric guitar, played by Eddie Van Halen. Speaking about the cover, group member David Lee Roth said: "It sounds like more than four people are playing, when in actuality there are almost zero overdubs — that's why it takes us such a short amount of time [to record]." Group member Eddie Van Halen, discussing the cover and discussing his synthesizer part in the track, said: "It takes almost as much time to make a cover song sound original as it does writing a song. I spent a lot of time arranging and playing synthesizer on 'Dancing in the Streets,' and they [critics] just wrote it off as, 'Oh, it's just like the original.' So forget the critics! These are good songs. Why shouldn't we redo them for the new generation of people?" Van Halen released "Dancing in the Street" as the second single from their 1982 studio album Diver Down. Their version attracted decent commercial success, reaching the top 40 on the US Billboard Hot 100 chart and becoming a top 15 hit on the Canadian Singles Chart. 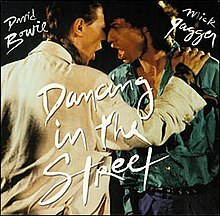 (1985) "Dancing in the Street"
A hit cover version of "Dancing in the Street" was recorded by the English rock icons Mick Jagger and David Bowie as a duo in 1985, to raise money for the Live Aid famine relief cause. The original plan was to perform a track together live, with Bowie performing at Wembley Stadium and Jagger at John F. Kennedy Stadium, until it was realized that the satellite link-up would cause a half-second delay that would make this impossible unless either Bowie or Jagger mimed their contribution, something neither artist was willing to do. In June 1985, Bowie was recording his contributions to the Absolute Beginners soundtrack at Westside Studios with Clive Langer & Alan Winstanley, and so Jagger arranged to fly in to record the track there. A rough mix of the track was completed in just four hours. Thirteen hours after the start of recording, the song and video were completed. Jagger arranged for some minor musical overdubs with Steve Thompson and Michael Barbiero in New York. The single version (Bob Clearmountain mix) is slightly different to the version used on David Bowie's Best of Bowie compilation and others, with the vocals and guitar brought out more and a slightly shorter intro. The David Bowie and Mick Jagger recording of "Dancing in the Street" was issued as a single on EMI, with all profits going to the charity. The song topped the UK Singles Chart for four weeks, and reached No. 7 in the United States on the Billboard Hot 100 chart. Bowie and Jagger would perform the song once more, at the Prince's Trust Concert on June 20, 1986. The song has been featured since on several Bowie compilations. In 1988, US TV network ABC used a sample of this song, to promote their 1988–1989 campaign, but under the name "Something's Happening", which is the 2nd year they used the same name, the first time being for the 1987–1988 campaign. In 2011 it was voted the eighth best collaboration of all time in a Rolling Stone readers poll. In a survey conducted by PRS for Music, the song was voted as the top song the British public would play at street parties in celebration of the 2011 Royal Wedding of Kate Middleton and Prince William. The pair went to Spinners Millineum Mills in London to film a video with director David Mallet. The music video was shown twice at the Live Aid event. It was also shown in movie theaters before showings of Ruthless People, for which Jagger had recorded the theme song. (2001) "Miracles Happen (When You Believe)"
It was Myra's cover of "Dancing in the Street" for the 2001 Disney film Recess: School's Out that really sparked the first Latina Pop singer signed to Walt Disney Records. She would then re-record the song in Spanish, titled "Bailando en la Ciudad", in 2002 for the Disney Channel original movie, Gotta Kick It Up! This version was also included on the Spanish edition of her debut album, "Milagros." The English version of the cover song was accompanied by a music video directed by Scott Marshall and choreographed by Darrin Henson. The music video was shot against a black & white studio background in Los Angeles, California, with Myra and her background dancers dancing with a disc jockey playing music with records. Another version was made in which the video is interlaced with clips of the "Green Tambourine" closing sequence of the movie and Myra performing against a bluescreen displaying clips of the film; this version was featured at the end of the VHS release of the film. "Street Fighting Man", a 1968 song from The Rolling Stones, slightly modifies a signature line from "Dancing in the Street" to be: "Summer's here and the time is right for fighting in the street." ^ "Dancing in the Street by Martha & the Vandellas Songfacts". Songfacts.com. Retrieved 2014-03-30. ^ "Show 26 – The Soul Reformation: Phase two, the Motown story. [Part 5] : UNT Digital Library". Digital.library.unt.edu. 2014-03-22. Retrieved 2014-03-30. ^ Whitburn, Joel (2004). The Billboard Book of Top 40 Hits: Eighth Edition. Record Research. p. 398. ^ "Item Display - RPM - Library and Archives Canada". Collectionscanada.gc.ca. 1964-10-26. Retrieved 2018-09-24. ^ a b "The Irish Charts – Search Results – Dancing in the Street". Irish Singles Chart. Retrieved September 24, 2018. ^ "Cash Box Top 100 Singles, October 17, 1964". tropicalglen.com. Retrieved 29 March 2018. ^ "Top 100 Hits of 1964/Top 100 Songs of 1964". www.musicoutfitters.com. Retrieved 29 March 2018. ^ "Cash Box YE Pop Singles – 1964". tropicalglen.com. Retrieved 29 March 2018. ^ "Grateful Dead Family Discography: Dancing In The Street". ^ "The Grateful Dead – Terrapin Station". Discogs. ^ "Grateful Dead Family Discography: Dancing In The Streets / Terrapin Station". ^ "Black Oak Arkansas – Dancing In The Street (Vinyl) at Discogs". Discogs.com. Retrieved 2014-05-02. ^ "Black Oak Arkansas – Street Party (Vinyl, LP) at Discogs". Discogs.com. Retrieved 2014-05-02. ^ Mojica, Frank (9 December 2010). "Break Yo TV: David Bowie and Mick Jagger – Dancing in the Street". Consequence of Sound. Retrieved 29 January 2016. ^ "ABC 1988 / Something's Happening on ABC". YouTube. 13 May 2017. Retrieved 24 May 2017. ^ "Readers Poll: Best Collaborations of All Time". Rolling Stone. Retrieved 2018-03-04. ^ "Austriancharts.at – David Bowie And Mick Jagger – Dancing In The Street" (in German). Ö3 Austria Top 40. Retrieved December 20, 2017. ^ "Top RPM Singles: Issue 0585." RPM. Library and Archives Canada. Retrieved December 20, 2017. ^ "MusicSeek.info – UK, Eurochart, Billboard & Cashbox No.1 Hits". Archived from the original on 2006-06-14. Retrieved 2014-06-16. . Cash Box magazine. ^ "Lescharts.com – David Bowie And Mick Jagger – Dancing In The Street" (in French). Les classement single. Retrieved December 20, 2017. ^ "Offiziellecharts.de – David Bowie And Mick Jagger – Dancing In The Street". GfK Entertainment Charts. Retrieved December 20, 2017. ^ "Nederlandse Top 40 – week 42, 1985" (in Dutch). Dutch Top 40 Retrieved 2017-12-31. ^ "Dutchcharts.nl – David Bowie And Mick Jagger – Dancing in the Street" (in Dutch). Single Top 100. Retrieved 2017-12-31. ^ "Charts.nz – David Bowie And Mick Jagger – Dancing In The Street". Top 40 Singles. Retrieved December 20, 2017. ^ "Norwegiancharts.com – David Bowie And Mick Jagger – Dancing In The Street". VG-lista. Retrieved December 20, 2017. ^ "South African Rock Lists Website SA Charts 1969 – 1989 Acts (Q)". Rock.co.za. Retrieved 29 January 2017. ^ "Swedishcharts.com – David Bowie And Mick Jagger – Dancing In The Street". Singles Top 100. Retrieved December 20, 2017. ^ "Swisscharts.com – David Bowie And Mick Jagger – Dancing In The Street". Swiss Singles Chart. Retrieved December 20, 2017. ^ "Official Singles Chart Top 100". Official Charts Company. Retrieved December 20, 2017. ^ "David Bowie Chart History (Hot 100)". Billboard. Retrieved December 20, 2017. ^ "David Bowie Chart History (Dance Club Songs)". Billboard. Retrieved December 20, 2017. ^ "David Bowie Chart History (Mainstream Rock)". Billboard. Retrieved December 20, 2017. ^ "Cash Box Top 100 10/19/85". tropicalglen.com. Retrieved 29 March 2018. ^ Kent, David (1993). Australian Chart Book 1970-1992. St. Ives, N.S.W. : Australian Chart Book. ISBN 0-646-11917-6. ^ "RPM's Top 100 Singles of 1985". RPM. Vol. 43 no. 16. 28 December 1985. Retrieved 30 July 2017. ^ "End of Year Charts 1985". Recorded Music NZ. Retrieved July 16, 2017. ^ "Top 100 Singles". Music Week. London, England: Spotlight Publications. 24 January 1987. p. 24. ^ "Cash Box Year-End Charts: Top 100 Pop Singles, December 28, 1985". tropicalglen.com. Retrieved 29 March 2018. ^ "15 Years Ago, Myra Made 'Miracles Happen' In The Princess Diaries". MTV News. Retrieved 2017-09-17. ^ Peraino, Judith A. (September 2015). "Mick Jagger as Mother" (PDF). Social Text. 33 (3): 94. Retrieved 19 January 2019. ^ "Interpolation (Replayed Sample) of Vocals / Lyrics". WhoSampled. Retrieved 19 January 2019. Kurlansky, Mark (2013). Ready for A Brand New Beat: How 'Dancing in the Street' Became the Anthem for a Changing America. New York: Riverhead Books. ISBN 9781594487224. Pegg, Nicholas (2000). The Complete David Bowie. Reynolds & Hearn Ltd. ISBN 1-903111-14-5. This page was last edited on 6 April 2019, at 04:42 (UTC).